The following two videos show what looks like an invisible shield that approaches the sun. Then every two weeks it moves from right to left. According to UFOvni2012, from 2000 to 2014 nothing happened but suddenly the shield arrives around mid-September 2014 and pushes the strong earth directed flames aside. Since October, The Jupiter-sized sunspot AR 12192 is the largest active region seen on the sun in 24 years. AR 2192 was actually one of the biggest observed sunspots of all time, ranking 33rd largest of 32,908 active regions since 1874. UFOvni2012 wonders if this shield was created by aliens in order to protect us from earth directed solar flares /CME’s. 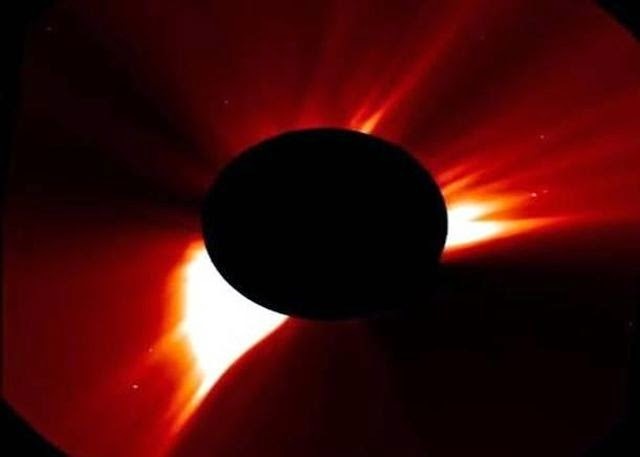 (Such flares and associated CMEs can create long lasting radiation storms that can harm satellites, communications systems, and even ground-based technologies and power grids). Or the shield appears to be a bow shock produced by an artificial magnetic field where solar subatomic particles compress the field to create this deflector array. But then again, it is possible that a bow shock is moving continuously from right to left over a long period of time? The latest data from the Interstellar Boundary Explorer (IBEX) shows the Sun and heliosphere to be moving more slowly through the interstellar medium than previously believed. This new finding suggests that beyond our Solar System's termination shock and heliopause, there may be No, or very little solar bow shock. These, along with corroborating results from the Voyager spacecraft, have motivated some theoretical refinements; current thinking is that formation of a bow shock is prevented, at least in the galactic region through which our sun is passing. So if there is a lack of bow shock then you may wonder whether indeed an alien race is responsible for this phenomenon. There is a second solar wind emanating from an approaching brown dwarf that is coming at us from Aquarius. This second solar wind first appeared in 2010 and has now progressed to the point that it is having an affect on the solar filament.